Join us in International Electronics Symposium on Engineering Technology and Applications (IES-ETA) 2019. The symposium is focusing on practical application of science and engineering to a wide range of real world problems, delivering the engineering technology from laboratory to marketplace. IES-ETA 2019 brings technology and business leaders, experts from academia, and government together to materialise the ideas. On behalf of our symposium organizers we warmly invite you to submit your research abstract and participate in this exciting international event. Papers must be written on A4-format page according to the IEEE template Manuscripts of minimum four (4) pages and up to eight (8) pages in length. The paper should be written in English. If you do not have an EDAS login, you can create a new EDAS account. Papers should NOT have: Page numbers, Headers, Footers. All review processes are double blind reviews. To ensure the double blind review process, please do not enter the author names in the paperthat is going to be reviewed. Keep the author fields as it is. The author names are required for final paper (camera-ready) version. The complete author names must be inserted at EDAS system. The author names and its position can’t cange after reviewed by reviewer. Add Authors. NOTE: The complete author names must be inserted at EDAS system. The author names and its position can’t cange after reviewed by reviewer. 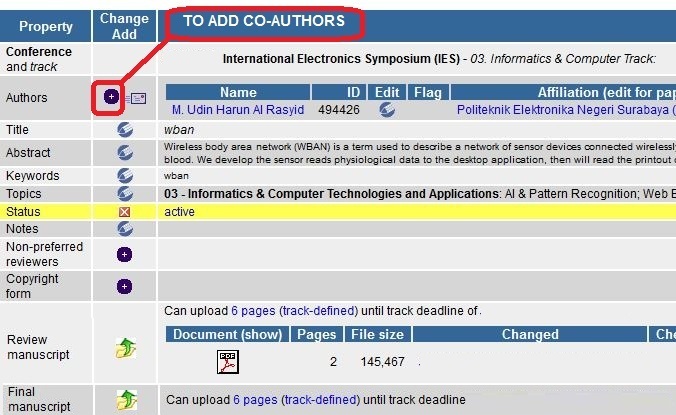 input ‘Name, EDAS ID or email address of authors’, then click ‘add author’ button. Choose one of the name list if the author has EDAS account, If not, click ‘none of the above’ button to create a new account at EDAS for your co-authors. – You can upload Final manuscript after reviewed by reviewer via ‘Final manuscript’. – You can add co-authors via ‘authors’ + sign. IEEE Member will get 15% discount. Early bird registration period is until August 26, 2019. 2. The Registration fee applies for 1 (one) paper under a 1st author, and strictly 2 (two) additional papers are allowed with free of charge of the registration fee under the same 1st author. 3. No refund will be made for registered participants who fail to turn up. Registration payment via Bank Transfer should be before October 22, 2019.
send an email to ies@pens.ac.id for confirmation with subject “IES2019 REGISTRATION” and write down your paper ID.